It’s the most wonderful time of the year, right? Yes, Christmastime is second-to-none, but what I’m talking about are those last minute, Hail Mary, maybe-this-will-work year-end fundraising efforts. I get it… not all organizations arrive at year-end without a plan in place; just fishing for whatever might help them get in the black before 12/31. Most nonprofits do have a solid plan – a tried and true year-end fundraising strategy that has worked year after year. This is great. But this strategy could become tired and predictable if it’s the same thing you’ve always done. Here’s what we know: Most of your major donors give one gift per year, and that gift usually makes its appearance sometime between December 1st and December 31st. Some of you may have a monthly giving campaign which is great for your organization’s cash-flow, but more than likely only accounts for less than 20% of your overall revenue. Which brings us to year-end. You’re staring at that gap between projected and realized income and something must to be done. Some nonprofits host an annual gala or banquet and others focus their efforts on an online giving campaign delivered through video, email, web and social media. Whatever your method of choice, there are a few things I’d like to remind you of as we deck the halls and and prepare our 2017 Annual Reports. This post is for nonprofit and ministry CEOs, leaders, fundraisers and marketing teams. Let’s take a few minutes and talk about some things that work, some things that don’t and how to NOT get on your donor’s “naughty list”. I want to remind you of something. Your donors became emotionally engaged with your organization before they became financially engaged. What was it that peaked their interest? What did they see or hear or experience that caused them to lean in a bit closer to your work? Your story is powerful. It tells us about a specific problem and who this problem affects. We resonate and want to do something about this problem. Your story tells us a little more about your solution and the important role you’re playing in fixing the problem. It tells us what steps will be taken toward restoration. It gives us a clear way to connect our passion and life’s mission with action. You see, your story is what keeps your donors coming back. This year, when you’re making your year-end asks, go back to your roots. Why did you even start this work in the first place? What was it that got your first core group of donors excited about the work? Start there. Tell that story. Sure, there will be details to fill in and latest updates to give, but don’t deviate from your story. I’ve said it before and I’ll say it again – a lot of nonprofit organizations and ministries suffer from “shiny-object syndrome”. It doesn’t take much to send them on an unnecessary detour and part ways with their mission. Peter Greer, CEO at Hope International, wrote a book called Mission Drift that dives deep into this epidemic. You should pick up a copy if you don’t already have it. Where mission drift can really hurt ministries is at year-end, which is oftentimes when the majority of your donors come back around for an update on how things are going. Far too often, ministries are quick to tell the donor a brand new initiative that they are focusing on in the New Year, instead of what worked and what didn’t over the course of the past year. Donors are oftentimes complicit in this too. They are not holding grantees more accountable to what it was they said there were setting out to accomplish. They are letting them off the hook. The goals and objectives for the current calendar year (what your donor gave towards last year). Were these goals and objectives fulfilled? What specific outcomes did you see? Provide three examples of top successes from the year. Provide three examples of shortcomings from the year. Your main focus for this new year. What does your strategic plan include? Describe, in detail, how your donor’s grant will be utilized and spent. It’s a good idea to include a project budget within your grant proposal. This “report” does not have to be long. Keep it simple…just one or two pages will suffice. This time of year, your donors are likely looking at many ministry and nonprofit updates for the organizations they support and a shorter report with punch and brevity may be the breath of fresh air your donor needs. In conclusion, don’t make your ask without providing some kind of update on your work over the course of the last year. Be transparent and show that you can and will be held accountable to your prior year’s commitments. I promise, your donors want to know what’s working and what’s not. They want to be brought in on the problem-solving process. They want to know what their investment return is. Show them. This is most definitely not the response you want from your donors when they receive your year-end letter or email. Be approachable and personal. Tell your story. And, no matter the method of your ask, don’t do it in a robotic way. One size does not fit all in funding asks. If you were having a face-to-face conversation with one of your major donors about their prospective grant for the upcoming year, you wouldn’t talk to them as though they were brand new donors, giving less than $100 per year, right? Then why would you send the same exact communication to major donors that you’re sending to smaller donors? I’m not saying that someone who has given $50 once is any less important than someone who has given over $25,000 annually over the course of many years. That’s not the case at all. What I am saying is that these two individuals need to be communicated to differently. Be smart. Be thoughtful. Be human. 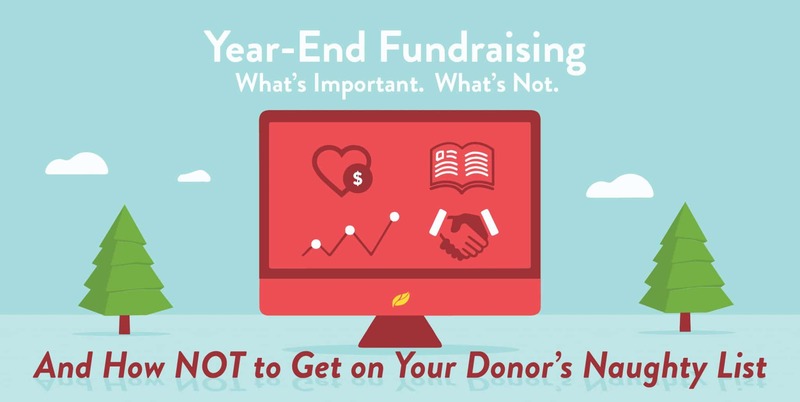 Treat your year-end fundraising efforts as if you’ll be having face-to-face conversations with each of your donors. Yeah, I get it – that’s not scalable at all. But you can be wise and do the heavy-lifting of segmenting your donor lists and creating more personalized inviting messages for them to read and take action on. In closing, if you can remind your donors of why they first became emotionally engaged with your work and show them clear and concise details of how the mission is currently being accomplished, you will surely make your organization a top priority for your donors and stay off of their ‘Naughty List’. Don’t give in to the temptation of including lots of fluff, insider-language and inconsequential details. This December, give your donors the gift of a crystal-clear, data-focused, story-driven update followed by a confident ask. Here’s to a profitable year-end for your organization!